MONTVALE, N.J., Oct. 15 – Today Mercedes-Benz is launching three new models powered by new-generation diesel engines that are impressively quiet, clean and fast. As earlier-technology diesels are disappearing from the U.S. market, Mercedes-Benz is announcing the availability of the ML320 CDI, a mid-size sport utility with a suggested retail price of $ 44,455; the R320 CDI, a six-passenger luxury vehicle priced at $ 44,775; and the E320 BLUTEC, a full-size luxury sedan that begins at $ 52,325 (all three prices include a destination charge of $775). Aided by its aerodynamic styling, the E320 BLUETEC boasts a whopping 40 percent better fuel mileage than a comparable gasoline-powered model, and its EPA city/highway rating of 27/37 miles per gallon means the luxury sedan can cruise more than 700 miles on a single tank of fuel. With a city/highway rating of 21/28 mpg, the R320 CDI gets 32 percent better fuel economy, while the ML320 CDI sport utility (rated at 21/27 mpg) provides a 26 percent improvement. Both CDI models have a cruising range of well over 600 miles before refueling. The transition has started to ULSD. It has been in the works for some time. The US is behind Europe in this regard, but we’re catching up. Since diesel is a more efficient fuel than gasoline, if emissions are equal, then switching to diesel is a conservation effort. The allowable sulfur content for ULSD (15 ppm—parts per million) is much lower than the previous U.S. standard for Low Sulfur Diesel (LSD, 500 ppm), which not only reduces emissions of sulfur compounds (blamed for acid rain), but also allows advanced emission control systems to be fitted that would otherwise be poisoned by these compounds. These systems can greatly reduce emissions of oxides of nitrogen and particulates. According to EPA estimates, with the implementation of the new fuel standards for diesel, nitrogen oxide emissions will be reduced by 2.6 million tons each year and soot or particulate matter will be reduced by 110,000 tons a year. EPA estimates that the reduction in air pollution from ULSD will save us about $70billion in health benefits, nationally. Right now it is about the only alternative fuel that works. Buying an E320 diesel instead of an E350 gasoline sedan has an additional cost of $1000. That will be amortized over about 18-20,000 miles due to the higher fuel economy. After that it’s cheaper than the gasoline equivalent. If, instead, you bought a hybrid that costs $8,000 more than the gasoline equivalent, well, that will probably never be amortized, especially if the batteries have to be replaced periodically. E85 Alcohol fuel costs more than gasoline and is 15% less efficient. It takes so much energy to make it that only 5% new energy is involved. A major change to alcohol-based fuels would raise the price of corn to the point of causing starvation in some poor countries. Noisy, smoky, and smelly—not anymore. Common Rail Direct Injection technology made them as quiet as gasoline cars. They don’t smell, and they don’t smoke. Slow/ hard starting— not any more. No “Glow Plug” light to wait to go out. CDI cars and trucks start like gasoline cars and trucks. Emissions—better now, much better in the near future. CDI and first-generation Bluetec engines meet new, tighter 45 state regulations, and second-generation Bluetec meet 50 state regulations. July 1, 2006—80% of fuel at refineries must be ULSD. September 1, 2006—80% of fuel at terminals must be ULSD. 100% of fuel at California retailers must be ULSD. October 15, 2006—80% of fuel at retailers must be ULSD. December 1, 2010—100% of fuel (for highway vehicles) must be ULSD. Although ULSD fuel will be the dominant highway diesel fuel produced, EPA does not require service stations and truck stops to sell ULSD fuel. Therefore, it is possible that ULSD fuel might not be available initially at every service station or truck stop and that a diesel retailer may choose to sell Low Sulfur Diesel fuel instead of ULSD fuel. The industries involved in the transition are doing all they can to minimize potential inconveniences during the conversion to the new diesel fuel. As part of the S15 (ULSD) regulation, the EPA requires that new labels be placed on every diesel dispenser in the United States, excluding California. The label should be located near the indicator that shows how many gallons you have pumped into your diesel vehicle. If the diesel fuel is S15 (ULSD) then the label will be titled "Ultra Low Sulfur Highway Diesel Fuel". If the diesel fuel is S500 (LSD) then the label will be titled "Low Sulfur Highway Diesel Fuel". In California, the state has mandated that ULSD be the only fuel available. Therefore, the EPA has exempted California from labeling dispenser pumps. …don’t worry about it. You can burn LSD or ULSD. You just can’t burn LSMFT. ULSD will run in any engine designed for the ASTM D-975 diesel fuels (the current stuff). Although engine and vehicle manufacturers expect ULSD fuel to work fine with existing vehicles, some older vehicles (mostly big truck engines) may have problems with fuel system leaks or fuel filter plugging. If you have one, check your vehicle's fuel system often to avoid these problems. Your vehicle may also get slightly less fuel mileage than it did with low sulfur diesel, but there should not be any effect on the vehicle's overall power. …just make sure the sign on the pump says “Ultra Low Sulfur Highway Diesel Fuel.” The fuel in the tank must be tested before that sign is put on. Thus a pump without that sign might have ULSD, but a pump with the ULSD sign won’t have LSD. Use LSD on your 2007 MY diesel, and any damage is not covered by the vehicle’s warranty. Theoretically you could be fined. ULSD costs 4-5¢ a gallon more to process than LSD. The price increase you’re seeing right now is the changeover cost being added to the fuel cost. Will it go down to its normal position of being cheaper than regular gasoline? Are you kidding? If I knew things like that I’d be living off my investments instead of working. But my guess is eventually, maybe. LOS ANGELES, CA (October 24, 2007) -- Motor Trend announced today that the Mercedes-Benz GL450 is Motor Trend's 2007 Sport/Utility of the Year. 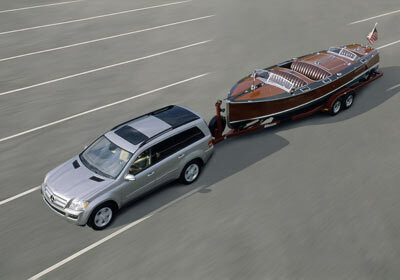 The GL was selected from a field of 22 vehicles—the largest crop of sport/utilities Motor Trend had ever evaluated. Angus MacKenzie, editor in chief of Motor Trend, noted that this year’s field was especially strong. To judge the prestigious award, Motor Trend’s editorial staff conducted exhaustive off-road, street and track testing, and carefully considered essentials such as driving performance, engineering, design, safety and features. Eligible vehicles had to be all new or substantially upgraded and on sale in the 12 months since November 1st each year. MacKenzie noted that this year’s Sport/Utility of the Year testing recognized the rapid and dramatic change in the sport/utility segment. Many industry observers have pointed to the rise of a new class of vehicle—the crossover—that more clearly delineates the SUV’s evolution from an off-road, truck-based platform to one that offers a more car-like experience with better feel and drivability. “If you look at the sport/utility segment on that basis,” said MacKenzie. “All of the vehicles that we drove this year are crossovers. It used to be that the sport/utility was an off-road vehicle, plain and simple. This year, only three vehicles—the Mercedes-Benz GL, the Jeep Wrangler and the Toyota FJ Cruiser—had real off-road capability. Many of this year’s new sport/utility models will be offered in two-wheel drive versions that will certainly be popular in states where weather and roads aren’t a problem. The complete report on the Motor Trend 2007 Sport/Utility of the Year testing and selection will be published in the December issue of Motor Trend, available on newsstands November 7, 2006. High-resolution images of the winner are available upon request and at www.motortrend.com/media. Multimedia coverage of the testing and selection process will be broadcast on Motor Trend Radio, hosted by Bob Long. Motor Trend, a PRIMEDIA publication, was founded in 1949 and has a circulation of 1.1 million and a total readership of 7.1 million. Internationally recognized as the world's number one automotive authority, Motor Trend is one of the leading brands in automotive publishing. The Motor Trend brand is comprised of Motor Trend Classic, motortrend.com; Motor Trend Radio; Truck Trend; Motor Trend International Auto Shows; Motor Trend en Espanol; and the renowned Motor Trend Car, Sport/Utility and Truck of the Year Awards program. PARIS, France – An extraordinary automobile adventure started today in the French capital. This afternoon, in the shadow of the Eiffel Tower, 36 Mercedes-Benz E-Class vehicles powered by clean diesel started on a long-distance journey of over 13,600 kilometers to Beijing, where the fleet will arrive on 17 November. Mercedes-Benz intends to use the diesel marathon across two continents to demonstrate the global potential of its drive technology. Over the course of the five stages, a total of 360 drivers from 35 countries will be seated behind the wheels of the E-Class models, which will cover a combined distance of more than 490,000 kilometers before arriving in the Chinese capital. 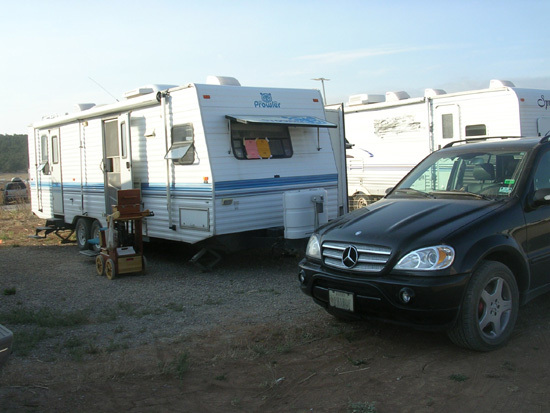 The fleet for the long-distance route is made up of production E-Class models, some of which have the four-wheel drive, 4MATIC. In addition to 33 E 320 CDIs, the field also includes three E-class vehicles with BLUETEC. This forward-looking technology makes the Mercedes-Benz saloon the cleanest diesel in the world. 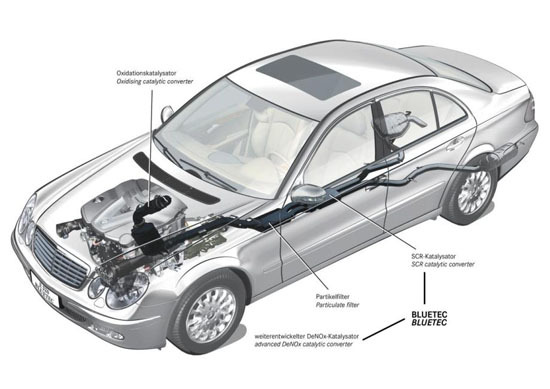 Worldwide, the E 320 BLUETEC is the first and only diesel engine that generates figures below the extremely strict US BIN8 exhaust gas standard, particularly in respect of nitrogen oxide emission. 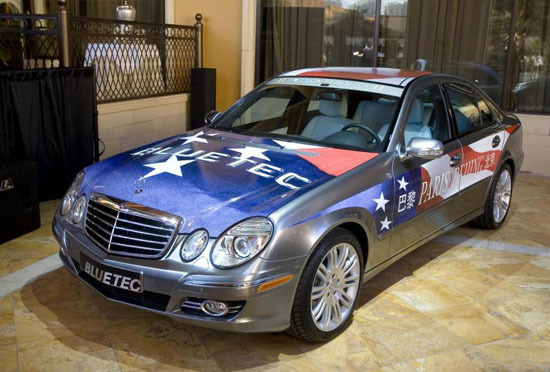 The 320 BLUETEC has been sold in the USA (in 45 states) and Canada since 15 October 2006. The engine consumes up to 30 percent less fuel than comparable vehicles with the gasoline engines in North America. With its enormous range of up to 1,200 km on one tank, it is predestined for an automobile marathon such as the Paris - Beijing - just as is the E 320 CDI. The route of the “E-Class Experience” passes through France, Germany, Poland, Lithuania, Latvia, Estonia, Russia and Kazakhstan to China. The itinerary largely follows that of the first transcontinental car race in history, which was run between Beijing and Paris 99 years ago. On this occasion, the aim of the French initiators was to demonstrate the technical superiority of the car over the horse. The winner was the Italian aristocrat, Scipione Borghese, who crossed the finishing line after 62 days, with his competitors arriving in Paris three weeks later. In a re-run of the long-distance route, 360 drivers from 35 countries will be sitting behind the wheel on the five stages - of between 1,750 und 3,550 kilometers. These include international journalists, VIPs and online applicants selected from more than 50,000 Internet applications. Due to the overwhelming demand, Mercedes-Benz increased the number of E-Class vehicles to 36 saloons shortly before the start. The most unusual vehicle in the fleet is a Parisian E-Class taxi, which is to accompany the convoy across the total distance over eight borders and six time zones. Thanks again for your informative newsletters! I felt the need to comment on a lapse in my driving availability and how ESP did or did not help, after reading this month's report on ESP. I own a 2002 E320. I had just picked-up my parents from the San Francisco airport and was headed home on I280 in San Mateo County, which runs through our coastal foothills. I think it was in February, a month that is typically cool here, but not snowy! The road condition was wet, and light rain was falling, very dark. Suddenly, there was a downpour of large hail…I hit the hail doing probably 65 MPH…and by the time I started to slow, I hit a dip in the highway where a lot of hail had accumulated. The car started sliding; I was braking, but probably didn't put the pedal to the floor. (I assume this negated the BAS and antilock function.) Eventually we were going backwards, and then stopped. The engine had stalled. I restarted, backed the car off the highway into the bushes. Luckily the traffic was light, and the other cars stopped or also slid off the road. I feel so fortunate that we all survived with no injuries, save for a small amount of scratches to my rear bumper. Now I'm wondering if the ESP and all the high tech gizmos actually helped? Why did the car stall? Does that stop the electronics from operating properly? 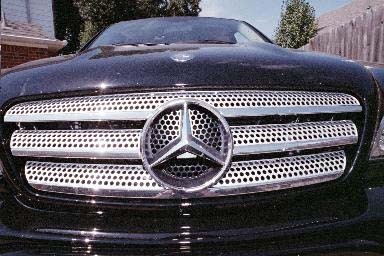 I have always felt the Benz was the safest vehicle to own, and although the quality on the'02 is not up to snuff…I still love my car, and the wife loves her '95 E300! Not putting the brake pedal to the floor had no effect on the BAS, ASR, and ESP. ESP is a wonderful thing but it can’t create traction where there is none. ESP won’t help on glare ice or in hydroplaning situations, such as driving on bald tires in the rain. A few years back two of our clients hydroplaned on bald tires and crashed. Both blamed the ESP, so the District Service Technician came down and tested the electronics. Nothing was wrong with the electronics. They had just waited too long to change tires. In your case, you encountered a freak weather condition. You encountered more hail and water than the tires could clear at the speed you were going, accentuated by the dip. No electronics would help then. Heavy braking wouldn’t help once you encountered the hail. The only thing that could have helped would be to enter the hailstorm at a lower speed. If the hail snuck up on you, then it might not have been foreseeable. Glad you came out okay. I've sure gotten old! I've had two bypass surgeries, a hip replacement, new knees Fought prostate cancer and diabetes. I'm half blind, can't hear anything quieter than a jet engine, take 40 different medications that make me dizzy, winded, and subject to blackouts. Have bouts with dementia. Have poor circulation; hardly feel my hands and feet anymore. Can't remember if I'm 85 or 92. Have lost all my friends. But, thank God, I still have my driver's license. Thought you might like to know that the article that you published as "Ode to Odie", Author Unknown, in your September Newsletter was actually entitled "The Journey" and was written by Crystal Ward Kent. I am little late, but your "milestone with Star Motor Cars" have touch many military lives across the Country and I am one of those veterans that appreciates what you do and hope you have the opportunity to serve the public another 25 plus years. You are a true veteran and should be proud that you served our great country and still today you have an impact in veterans lives. I remember going TDY in June 1984 from California to Louisiana my 1982 Saab caught on fire in Memphis, TN and burned up, I rented a car and began my journey and made my way into Houston, Texas and when I saw the sign Star Motor Cars 7000 Katy Rd. I stopped in just to look at another Saab with no intention of buying one not until my 6 months TDY was up and return back to Sacramento, California. Until this day I still remember meeting you and telling you what had happen on my traveling from California and you shared your time of being an officer in the military, I think Army and I won’t hold that against you, (Smile.) As you know if you remember I was Air Force. Anyway you had a 1984 Black Saab 900T in the showcase window, before I knew it you had sold me that vehicle and closed the deal with my credit union by telephone and then followed me out to the airport to return the rental car and gave me a ride back to dealership while my vehicle being prep for me to get back on the road to reach my final destination England AFB, La. When I returned back to California in December everyone still thought it was the same vehicle, because I picked the same color as well as interior. It was funny to me, my other team members told them they actually saw the old vehicle burned to the ground themselves. I was transferred to Ohio in November 1985 served 2 years and shipped to Korea. Then in December 1988 after returning from Korea that 1984 caught on fire the same day that I got home in front of a Nissan Dealership 1 mile from my house and I purchased a 1988 Nissan Maxima and purchased 1997 Nissan Pathfinder in 1997, and 2000 Maxima in 2000. I know I spoke with you a couple of times over the years and you never dropped me from your mailing list and I continue to receive Curt's Newsletter and I am very grateful for that. Just like for you to know that I will be looking to purchase a Mercedes next year about this time frame and I will be coming to Star Motor Cars to purchase it to from a people person car salesman no other than Curt Rich and thank you for the years. 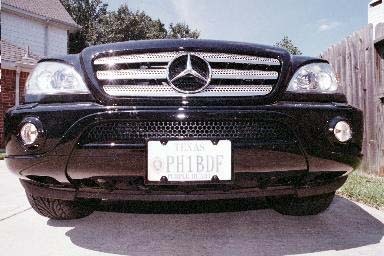 My 2002 ML55 AMG, Darth Mercedes, is going away, replaced by a 2007 ML320CDI. Though The Redhead argues the 1987 190E 2.3-16 was the best Mercedes we ever had, I vote for the ML55 AMG. It arrived September 20, 2001. I spent a couple of sleepless nights deciding whether to take it or not. After we were thrust into World War III on September 11th, we hadn’t sold a car, and we didn’t know when we would sell cars again. I had no idea how I would pay for it. But I also figured I would never have another chance at an AMG product. AMGs are the ultimate Mercedes, and I had wanted one for some time. 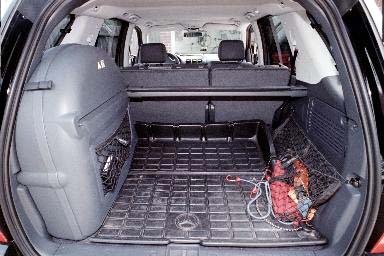 This series ML had a nice, hidden, lockable compartment in an area most smash and grab thieves or valet parking attendants don't know about. 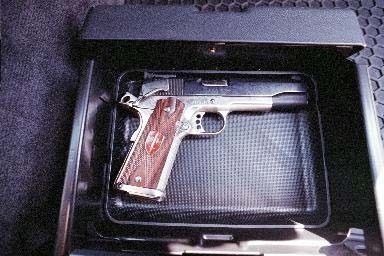 This is useful in Texas, where concealed carry is not only legal, it's encouraged. 2002 MLs used CD technology for the navigation, pretty good for its day. 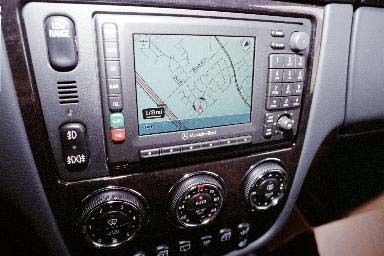 Technology sure marched on in GPS navigation technology. A lot of people, I discovered, woke up on September 11th and realized this was their last chance at a particular dream. October through December sales were very high, and I heard over and over the customer say that he had been pushed into buying his dream car by September 11th. America joined the ranks of combat vets, who know that life is capricious, and none of us is promised another sunrise. The ML55 had 5 cupholders. I never used more than three while by myself. Of course by January the anti-American news media had put the country into a mental state of depression, and car sales died for most of 2002. But I hung on. If this wonderful vehicle had a flaw, it was that the spare tire had to be carried inside, and that took away a lot of storage space. 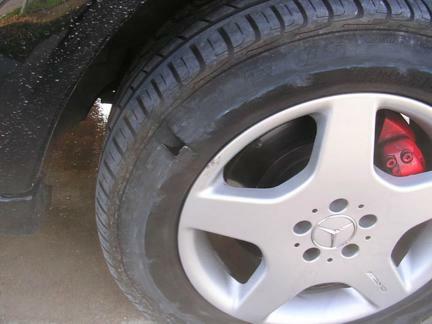 "Normal" MLs had the spare tire underneath, but the AMG version had dual exhausts, a thick anti-roll bar, and a 25 gallon fuel tank in the area a spare would have gone in. 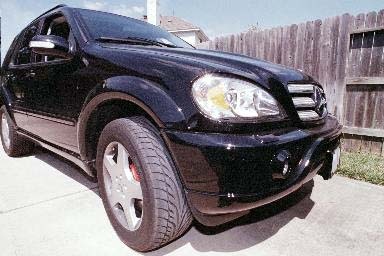 The ML55 AMG has been a fantastic vehicle. It is just as fast and stable as predicted, and reliability has been magnificent, as is usually the case with AMG products. It got to 91,713 miles at turn in. Tire wear wasn’t good at first. I replaced the Dunlops with Pirelli Scorpion Zeros at 19,000 miles. But they lasted 35,000 miles. Remember, this is a 5,000 lb., 155 mph vehicle. It comes with W-rated tires. Brake pad life was about what I expected, with 20K miles out of rear pads and more out of the front. The anomaly was because of the switch to the S-Class brake proportioning valve, which gave shorter stopping distances by using more of the rear brakes when straight line braking and reverting to 75%/25% in turns. The Scorpion Zeros were outstanding tires. So when they began to show their wear bands, I called the Tire Rack to order more. They had been discontinued—too good the Tire Rack guy joked. So I go Continentals, and I’ve put 2 sets of them on. 2 were replaced early, one because the tire wouldn’t withstand running over a 6” tall spike (I-10 Lane divider). The other got a sidewall puncture. Cheap, shoddy Continental tire couldn't ride over a 6" spike sticking vertical in the freeway. Other than that, a window regulator, some emission part, a trip computer, and maybe another part or two were replaced. Of course the battery was replaced, but it had the courtesy to die at the front door to the store and work one more time for the technician to move the truck to his stall. No bodywork was ever needed. It wasn’t for lack of trying. I backed into the garage doorframe, and the plastic fender flare sustained no damage, the paint polishing out. A $50 car sideswiped me one night on I-10. The $50 car was heavily damaged. 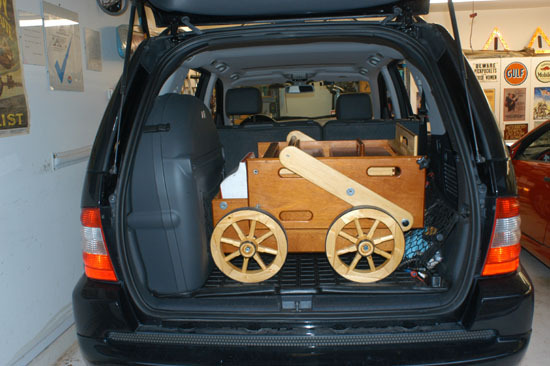 Making the most out of the space available, I built a gun cart for SASS events that folded up into the space available and still carried all the accoutrements of someone shooting 4 guns in competition, all shooting black powder, and two of them being percussion. I went home, got out Mequiars, and polished out the fender flare again and got the Nissan paint off the wheel and tire. We went on some really neat trips together, New Mexico and Colorado chasing antique trains, New Mexico for End of Trail, lots of SASS matches, 91,713 miles of memories. It never failed to start. It was never towed. It was a really good friend.